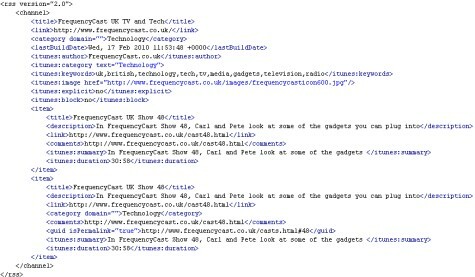 This is a single text file containing data that’s used by podcast distribution services (like iTunes), and podcast ‘catching’ software used by end-users. How do I create a podcast RSS feed? The RSS feed is a text file, you if you were adventurous, you could code it by hand using a text editor like Windows Notepad, although because the syntax has to be 100% right, you’ll really want to be using a tool. 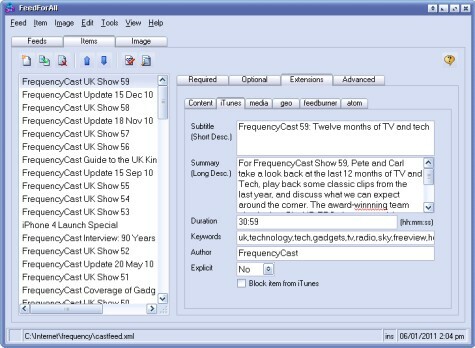 A podcast RSS feed contains two sets of information – details of the podcast as a whole, then details of each individual episode of the podcast. If you’re using WordPress (the leading free content management software) for your website or podcast, then there’s a great plug-in that makes releasing a podcast easy. For more details on the PodPress plug-in, see the PodPress website. It’s free. Once you have your RSS feed text file, upload it to your website. 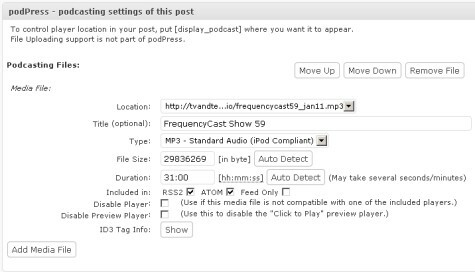 If you’re submitting your podcast – and you really want to be doing that, as iTunes is the number 1 podcasting platform, then you’ll need to make sure that your podcast RSS feed contains some specific iTunes tags, including a tag for the iTunes store artwork, iTunes categories and keywords, as well as good descriptions for your podcast and for each episode of your podcast. Both PodPress and FeedForAll have built-in support for the iTunes tags. You can find full details f what’s required on the Apple iTunes Podcast Tech Specs page. Once you have your RSS feed, you need to check that is works. To do this, use an XML validator. Go to http://validator.w3.org/ and paste in your feed’s address – this will check for errors. The results can be a little complex, but running a validation is important to ensure that your feed isn’t broken. The FeedForAll app mentioned above includes a built-in validator, which makes feed creation a lot easier. Researching basics ahead of planning a first podcast… hopefully… I have little of merit to comment here except to thank you for a really useful site. Much appreciated!